Vaughn and Favreau looking like a screensaver. 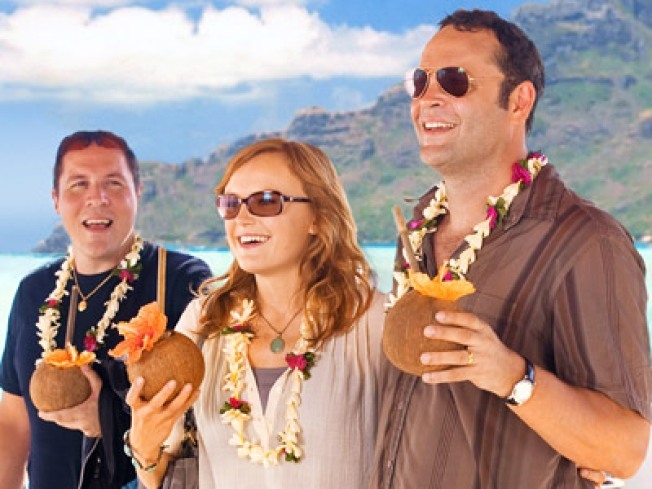 Consider Couples Retreat a sequel of sorts to Swingers, Jon Favreau and Vince Vaughn's 1996 breakthrough and ode to the neo-lounge singles scene. Couples Retreat, which the duo co-wrote, finds our boys a little older, no wiser, and like the every-dudes they play in the film, having lost a step or two over the years. Vaughn plays the same sort of fast-talking braggart lunkhead he was in Swingers (and The Breakup), but Favreau's character is a left-turn from the sweet, shell-shocked guy he played in Swingers. In his new film he goes the full A-hole, playing the guy who stills says he "rocked at high school football," attempts to bully a masseuse into giving him a happy ending, and worries about having to sit alone at the bar at Applebees with no one to listen to his stories of gridiron glory. The film chonicles the hangover of the after-the-ecstasy-the-three-year-old-peeing-the-500-thread-count-Egyptian-cotton of married life. All together less sophisticated (and that is saying something) and less funny than Wedding Crashers, Retreat nonetheless covers the same fertile love-is-a-battlefield territory as Crashers and even Swingers -- though both of those films reaffirm the value of relationships more convincingly than does Retreat. The screenplay lacks dash and real depth and relies on sitcom-y clichés to keep the story going. That being said, the stars' antics are enjoyable enough. The basic set up is that the married couples (and one divorced friend bringing his 20-year-old girlfriend) are off to an island paradise together to help Jason and Cynthia (Jason Bateman and Kristen Bell) repair their marriage at a spa and counseling center called Eden. The island actually has two halves separated by a supposedly impassable lagoon -- with Eden West being the heavily structured couple's side and Eden East a Hedonism-like singles paradise where anything goes -- setting up a clumsy allegory for the group's lives. Most of the bright spots are in the cast, but a sort of laziness creeps in: Letting Vaughn riff -- hilariously and at outrageous length -- about the analogy between Richard Simmons wanting to stuff his face and married couples wanting to get away is one thing. Letting Vince Vaughn riff -- way too long and not so hilariously -- about being attacked by a shark, complete with panicked splashing and squealing is another. Couples Retreat opens this weekend.